Da Wu originated from the Tang Yao Period (about 4,000 years ago) and is a health-preserving method which channels the joints and dredges the meridians by the form of dance. Health Qigong·Da Wu, based on historical records, uses the ascending, descending, opening and closing of body movements with the conjunction of breathing and mind adjustments to regulate organs, dredge the meridians and nourish Qi and blood, thus achieving the purpose of rehabilitation and health preserving. 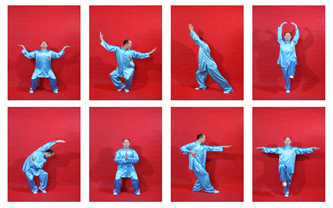 In the practice of Health Qigong·Da Wu, the spirit guides the dance postures, and the dance postures practices the shape. It is simple and graceful, smooth and flexible, coordinated with mind and Qi, and suitable for different groups of people. Long-term exercise can enhance upper limb’s strength, flexibility, balance, and cardiovascular system’s function, improve the negative mood of anger and depression to enhance the sense of happiness.